At least 16 houses including 15 kachcha and 1 pakka gutted in major fire accident at Naharlagun on Tuesday. 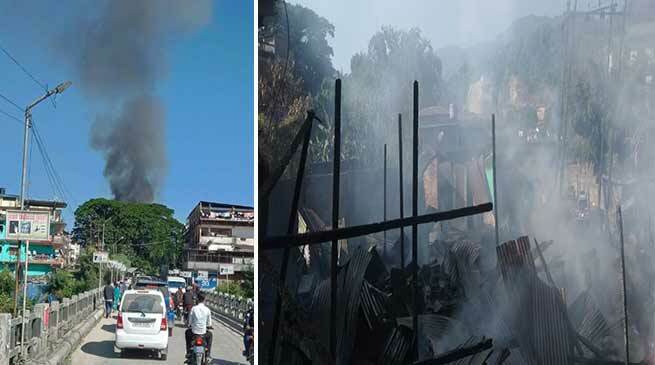 16 houses were reduced to ashes in a devastating fire at C-sector, Naharlagun on Tuesday noon. However there has been no report of human casualty. Fire accident broken out at the resident of Tami Tayok at C-sector near Little Rose School, Naharlagun. As per the report two gas cylinder blast leads to fire. According to police sources at least 15 nos. of OBT ( kachcha house ) rented houses was completely gutted down and one RCC building has partially burnt down belonging to Tayo Rellum w/o Dr. Tayo Talom. No any casualties was found except gutted down completely all the household properties of rented families and owner of rent building. There was 4 families in the rented house. Alleged that fire was broken out from the OBT kitchen of owner.